Students - Today's verse is about our new kitten, Fiona. 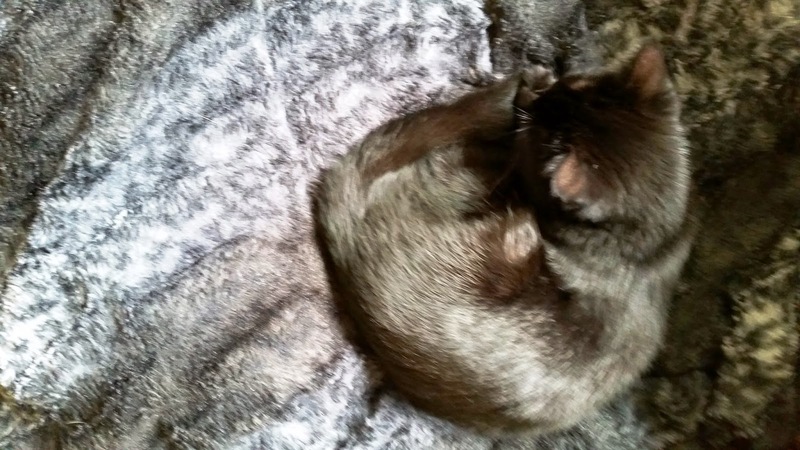 I saw her curled up on Georgia's blanket, and I loved the sound of "kitten" and "camouflage" together. The rest of the poem just grew around those sounds. It is fun for me to read. Can you find other similar sounds in the poem? Look for consonants that repeat near each other. This is called consonance. Look for vowels that repeat near each other. This is called assonance. Alliteration is when sounds at the beginnings of words repeat near each other. When you write a poem, experiment with the sounds at the starts of words and also the vowels inside of words. Rhyme is not the only way to play with sound. Is there a daily image you love? If so, do not miss a chance to write about it. I love seeing Fiona curled all around the house, and now I can read this poem to her as she sleeps. Today I am honored to welcome Emily, a fourth grade poet from Louisana. Margaret Simon from Reflections on the Teche, is one of Emily's teachers, and I am thankful to share her poem today at The Poem Farm. It is an acrostic, but it is so well written that you might not even realize this if we didn't tell you. You do not want to write a "lazy" poem. Think about descriptive words that other people would be able to imagine. Try to use metaphors that are related to your subject. I don't really know how I do it; I just love to write. I want to be a poet. Emily is a poet already, and I very much hope to have the opportunity to read more of her work. Students - I recommend trying one of these writing tips when you write. What do you think Emily means when she refers to a "lazy" poem? Much gratitude to both Emily and Margaret for this Poetry Peek today. This week's Poetry Friday roundup is over at Today's Little Ditty with Michelle. Head on over for some new poems and to visit with some new and old friends too. 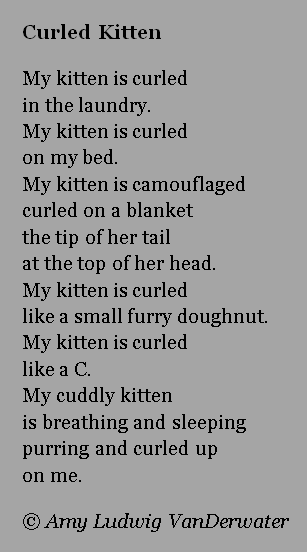 Such a delightful kitten poem, Amy. Miranda's going to go gaga over it! And that Emily... she's something else, isn't she? She writes awesome zenos too! I think she can probably write anything she sets her mind to. Erin says, "I think a lazy poem is a poem that doesn't want to do anything. It doesn't give pictures in your mind. It doesn't inspire the reader. It doesn't give the reader something to talk about." Emily says, "A lazy acrostic is when you just put one word. I like to describe and use metaphors. I feel like I'm special to be here on your blog." Thanks, Emily, for validating my students and me. We feel like real poets today! Thanks for posting Emily's poem. It presented an element of surprise. I expected peaceful images with fluffy clouds, but the poet took me on a different journey. Very well done! I love the sound of kitten, the repetition of curl, and especially the assonance of curl and purr! I love how Emily has made the acrostic form her own, especially since I usually only associate them with one word. And congrats on all of your upcoming books. Forest Has a Song is one of my favorites. Looking forward to reading the others. I am longing for a cat that will curl up with and love me. Our big bruiser is AJ's buddy and will curl up with and on him, but I am only staff to him -- good for grooming, ear-cleaning, and food-serving.